Lens design is a constantly evolving area, with new innovations and improvements being introduced seemingly every month! There are now a vast array of exciting new products available, each designed to enhance the wearers vision and comfort. Traditionally, plastic lenses are manufactured by injecting a liquid monomer into a precision made optical mould. It is then cured to produce a "semi-finished" blank with an optically correct front surface curve. Once the final prescription of the lens is decided, the semi-finished lenses go onto a generating machine which mills and polishes the rear surface of the lens to the correct power. Although the accuracy of production is very good (0.06D), there is a limit to what can be acheived using this method of lens manufacture. Spectacle lenses with an aspheric surface have been on the market for many years. Originally developed to improve the corrected vision of aphakics, aspheric surface lenses are now used to give a good compromise between cosmetic appearance and optical performance. Digital surfacing technology allows lenses to be created by calculating the optimum lens surface for individual prescriptions. At thousands of points on the surface the lens power changes to maintain optical performance. The free-form surfacing process precisely cuts the prescription into the lens using a diamond point guided by a computer software program to an accuracy of 0.01D. A lens that is well designed with free-form techniques and produced properly using free-form processing can provide superior results. However, it is also true that a lens which is poorly designed using free-form techniques yet still properly produced with free-form processing will provide inferior results. It’s the design that matters, followed by correct free-form processing. 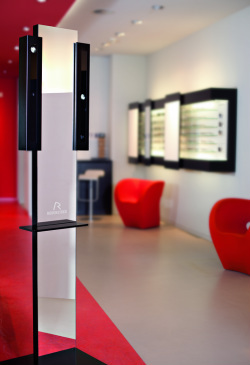 The Rodenstock ImpressionIST gives us the opportunity to provide professional knowledge and service backed up by the latest high-tech development. While video systems for spectacle fitting have been available for some time, only the ImpressionIST makes it possible to truly measure the spectacles in all three dimensions and to transfer these measurements 1:1 in optimum fashion to the later position in front of the eyes. 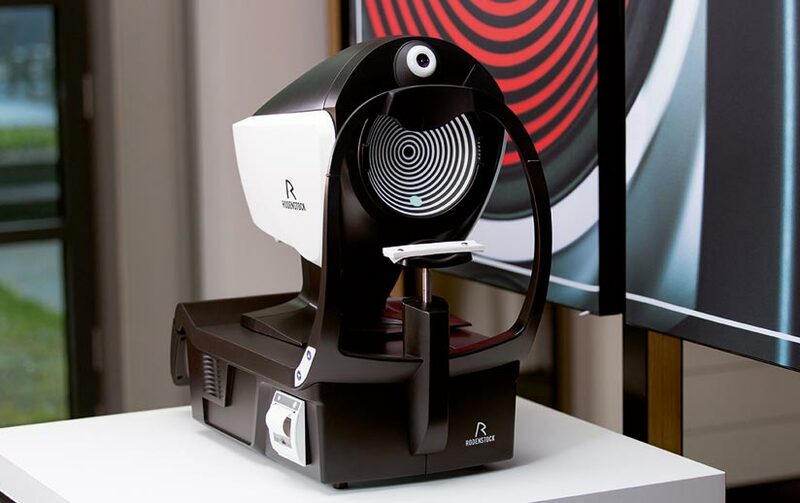 The Rodenstock Service Terminal ImpressionIST has a unique 3D video centring system for a fast and precise measurement of all centring data of the lenses and of the individual parameters - single PD, corneal vertex distance (CVD), face form angle and pantoscopic tilt. High precision in measurement is guaranteed - for instance, even unintentional head movements during the measurement are automatically corrected in the subsequent computation step. The sophisticated two-camera technique means that the determination of the centring values and the individual parameters is also possible for the first time with highly curved sport frames. The new DNEye® Scanner by Rodenstock allows you to carry out eye measurements with an unprecedented degree of precision. The DNEye® Scanner registers lower and higher order aberrations of the eye for both near and far vision, as well as the brightness-dependent changes of the pupils, to allow 100% exploitation of your vision potential. ​No eye is perfect but every eye can be perfectly measured. In the ideal eye, the light entering projects a precise image on to the retina. But that is only theory. In real life, each eye shows lower and higher order aberrations. These lead to a deformation of the wavefront entering the eye, which blurs the image projected on to the retina. The size of the pupil depends on various factors. For example, everyone is familiar with the effect of glare: the pupils constrict immediately. When there is less light the pupils dilate again. However, in terms of lens optimisation, what is more important is the near reflex – i.e. the interconnection between accommodation, convergence and constriction of the pupil. When we look at something up close, the pupil constricts. As a rule, the larger the pupil, the stronger the influence of the higher order aberrations on the vision quality. These deviations are registered by the DNEye® Scanner and are used by Rodenstock for lens optimisation. With DNEye® Rodenstock has developed an analytical calculation method for lower and higher order aberrations. These measurements contain vital additional information about your visual system and Rodenstock then uses all these parameters to calculate the ideal lens. The ideal spherical and cylindrical correction values are calculated for every viewing direction and every pupil size. The result of this highly complex optimisation technology is a lens that offers the wearer optimal correction in every visual point. For everyone who wants to see more with their spectacles, Rodenstock has developed the first truly individual single-vision lens on the market. Impression® Mono does not only offer more from an aesthetic point of view, but also provides optimum vision no matter what the prescription is. The individual matching to your vision demands guarantees sharp vision up to the edge of your spectacles. And the Impression® Mono lenses are characterised by high durability despite the thin and light material - so that rimless frames can be a reliable choice. Impression Mono Sport® provides greater safety in sports thanks to the best possible spatial vision. The individual matching to your vision demands guarantees sharp vision up to the edge of your sports spectacles. Rodenstock can offer a wide variety of tints for the most varied types of sports. The contrast-enhancing tints permit very good detail recognition and a natural rendition of colours. Even though they are thin and light, Impression Mono Sport® lenses are also characterised by high break resistance.